People travel to Myanmar (Burma) and asking themselves why is the Shwedagon Pagoda so famous actually the simple fact is that is the "Vatican of the Buddhist world" with golden pagodas temples monks nuns novitiations and a incredible festival. 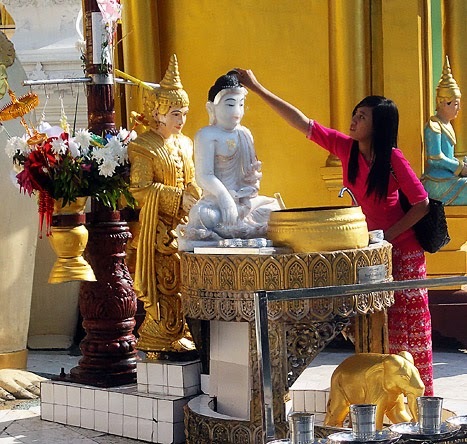 The entrance fee is (2019) about $ 8,- some of the money taken in from tourists, foreigners and by donation is used for the continuous renovation work to keep the Shwedagon architecture up to date. The people are fighting with the results of the monsoon because they still haven't been able to isolate the brick walls against the flood from above so its every year the same deterioration and renovation of the pagoda and temples. Opening hours are from about 4 am to 10 pm. Below is a Shwedagon Pagoda map, pls. note that this a platform on a hill in the center of Yangon with around 300 bigger and smaller sacred buildings which are mainly Buddhist pagodas temples and shrines see the Shwedagon map and photos of monks and novitiations below plus Buddhist Nuns to get a better idea. This is the most famous pagoda in Myanmar (Burma) an incredible display of Buddhist devotion plus exotic colors and for the physical and spiritual expression of sacred life. In importance behind is the Mahamuni Temple in Mandalay and the Shwezigon Pagoda in Bagan. To complete the fact sheet the tallest pagoda in Myanmar is the Buddhist shrine in Bago with 98 meters height. Rising to a height of three hundred and sixty-eight feet it is taller than St. Paul's and its size is greatly enhanced by the fact that it stands on a small hill that is itself one hundred and sixty-six feet above the level of Yangon City. But as a matter of fact the Shwedagon Stupa is not the tallest in Burma that is the Shwemawdaw Pagoda in Bago with 114 m (374 feet). You can buy the Buddha Statue just click on it it's a very decorative item. This circumstance gives it a very strong optical appearance over a wide horizon and long distance. 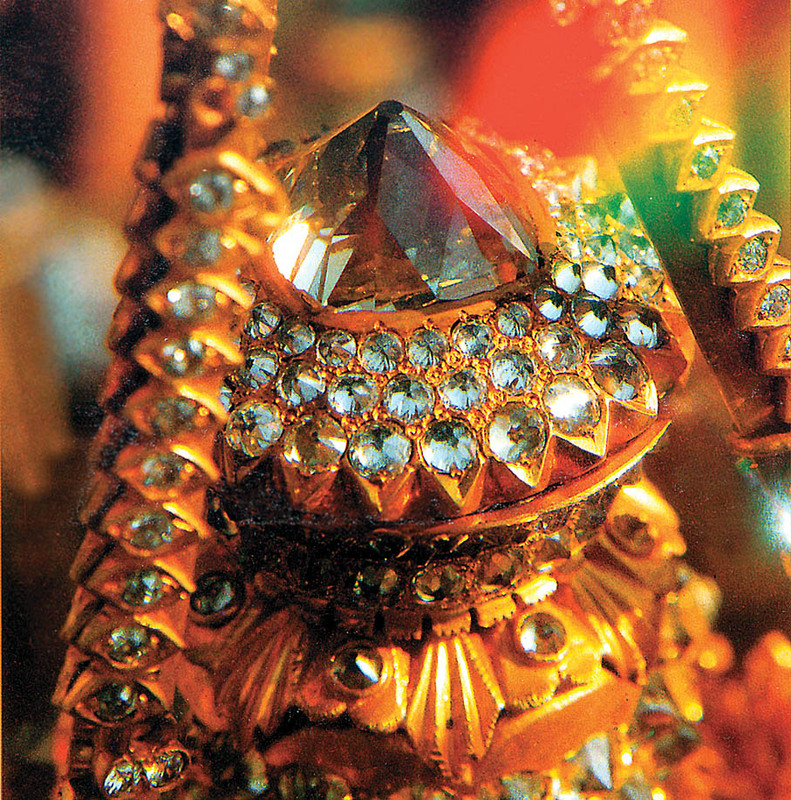 Its spire of gold with the diamond orb on top touched by the reflecting sun is the first object upon which the eyes of a traveler rest when approaching Yangon (Rangoon). The stupa is covered with pure gold from base to summit, and once in every generation this gold is completely renewed by public donations. Yet throughout the interval the process of regilding goes on continuously. Devoting people who seek in this way to express their veneration and to add to their store of spiritual merit climb up daily with little fluttering packets of gold leaf which they fasten somewhere on the surface. The central stupa is one of the holiest shrines in the Buddhist world and this has a reason just look through here. Actually, this is a large pagoda platform with over more 300 temples and shrines grouped around. This is a highlight of every Myanmar Journey. Shwedagon Pagoda opening hours are from 04:00 AM to 22:00 PM every day, last admission is at 21:45. There are two days of the year when the platform is open 24 hours., the Waxing Day of Tabaung, means the day before full moon day of the Myanmar Lunar month Tabaung in March and on the Waxing Day of Wakhaung. Here are more Shwedagon Pagoda Pictures. When visiting it needs to pay $ almost 10,- entrance fee. I never heard that there is an entrance fee in a church, Taoist Temple, Mosque or Indian Temple. Only Buddhist use their Lord to cash in on foreigners, that's the same in Thailand but interestingly not in Malaysia (Malaysia has several Buddhist shrines). I think it is not a good idea to use Buddha to milk the tourist he definitely wouldn't like that. It needs to understand that the Shwedagon Stupa is only one among about 200 other Buddhist shrines on the platform. Clothing should reach at least down to knees and elbows, have your upper body covered up to the neck. No shoes allowed, there is a storage at the south entrance where you can leave them and also wash your feet after coming back. Be aware that the platform is covered with marble tiles that mean from around midday to 3 pm it is almost impossible to walk since they are awfully hot. 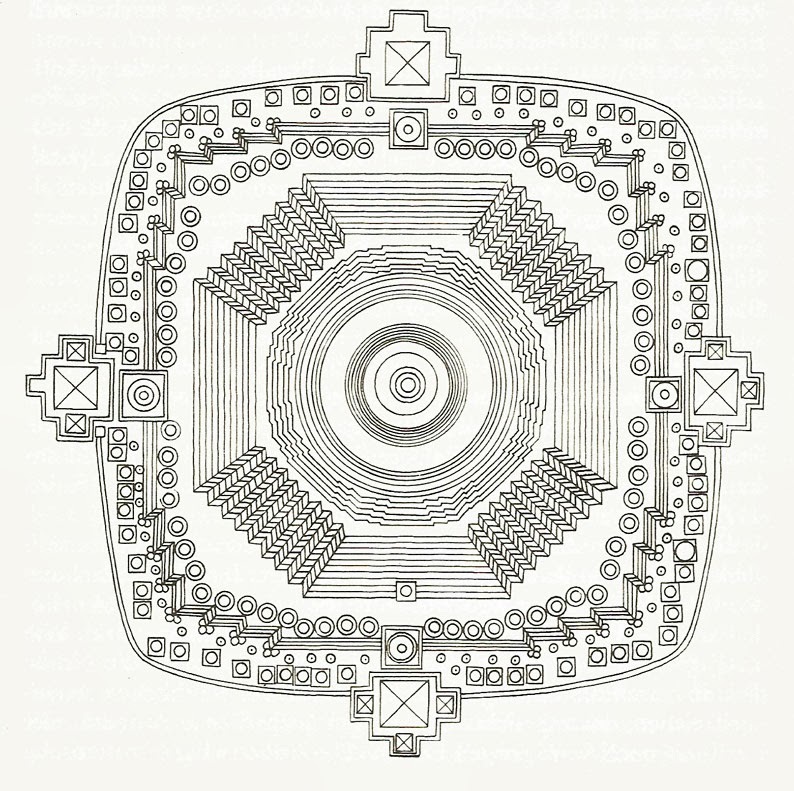 The layout is a solid structures, enshrined are sacred relics or precious items set on the platform with more than 200 smaller buildings around. Visiting the platform and the central stupa of the complex at the southern part of the. The levels of the base almost merge with each other. 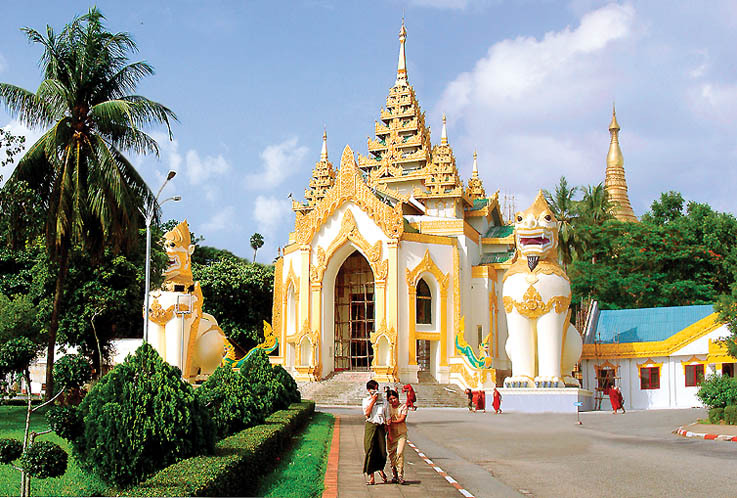 Around the monument is a ring of smaller stupas rises that surround the central The Shwedagon has an elongated elegant silhouette, a classic example of a Buddhist stupa, read more. Some other Buddhist Shrines elsewhere are here, actually there are thousands of them everywhere in the country, big and small, gilded and plastered wood and masonry, metal and plastic, jade and porcelain, just name it, it is overwhelming, read more. At the West Entrance, are two nine-meter high Chinthe figures, this are statues of fantastic guardians partly looking like lions built in a naive realism. As in many countries the lion is a symbol of power. In the stairways up to the platform are dozens of shops selling everything imaginable from toys to Buddha images, flowers etc. 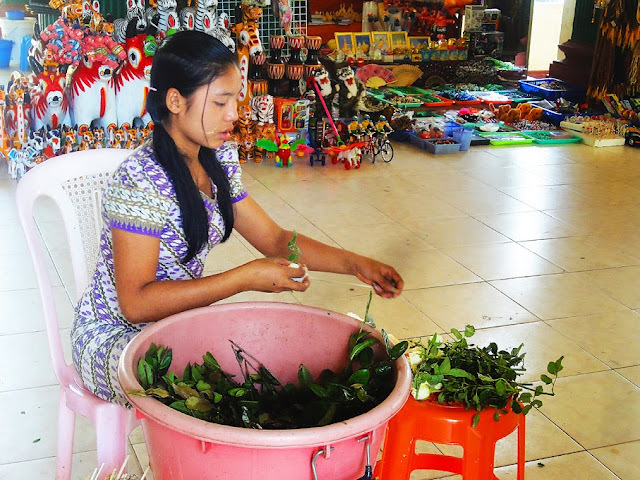 The Myanmar Girls below is preparing roses for donation to the Buddha Statues. Many people have "their" preferred shrine where they pray and present the flowers to their Lord. On the first step shoulder of the Shwedagon base are 64 small, three to four meters high pagodas. Four more which are a bit bigger rise at the axes of the complex. The central building is distinguished by noble proportions, carefully crafted details and by some games of light and shadow as the sun moves. The cover ( Hti ) on the top is from 1871. It consists of seven gold rings, diamonds and plenty of more donated gold and jewelry it is 10 m high. 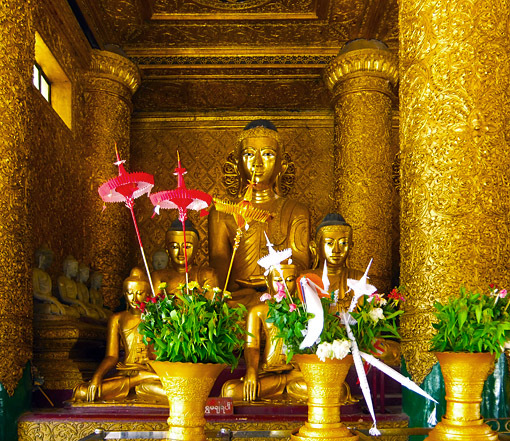 The mast is made of a silver alloy and decorated with four golden Buddha bas-reliefs. This precious crowning of the stupa is studded with 5451 diamonds in various handcrafts weight of 2078 carats, and with about 1470 other precious stones. The total number of gold and silver bells fiber amounts to 1500. The lower part of the 99.5 meter-high monument is covered with gold leaf , the top with more than 14 000 gold films in the format 30 x 30 cm and a total weight of about 100 kg. The Hti sparkles in the glow of countless gold and silver bells that surround him. Above extends the mast with the likewise made of gold weather vane and the Seinbu ( the " diamond bud " in the form of a golden sphere of 25 cm diameter). The edge of the platform is occupied by numerous buildings and objects of various shape and determination. This includes dozens of different stupas , Buddha images and numerous Tazaungs with bells and rest houses for pilgrims ( Zayats ) and administrative offices. They are distributed without any particular order. Most struvtures on the platform were built in recent decades, especially after the devastating fire in 1931 , which destroyed 20 buildings particularly on the east and west sides. The traditional walk around the central stupa narrows in some places up to 10 m and widens to other up to 30 m. The paving of dealing with Italian marble and mosaic slabs of concrete was carried out in 20 Century. When visiting the place keep in mind that the marble gets heated up and it around noon riches as temperature which makes is almost impossible to walk on it, this is important to mention since nobody is allowed to wear shoes and similar stuff. Every few decades the monuments get a "facelift" or renovation. This is a craft task with a political twist, because certain people move into the spotlight to gain merit and show others what devout Buddhists they are. About Myanmar Burma History >. Big Buddha Sculptures, small ones, new, old and of various quality. 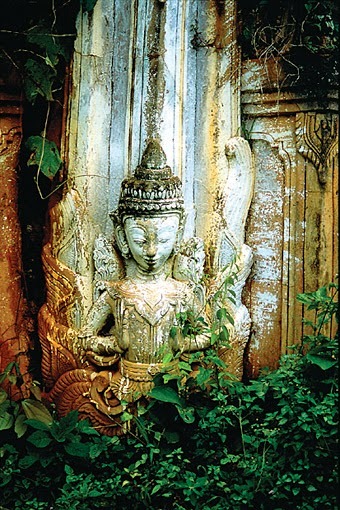 The statues have naturally religious and often just decorative function in a home or office. Many Buddhist devotees place them in a temple on the platform to gain merit, some built a whole pagoda, shrine and temple and place them there. Since this is a popular habit in the country there are probably millions of them virtually everywhere. on hills, mountains on islands in the river, offshore or just as a jade pendant around the neck. 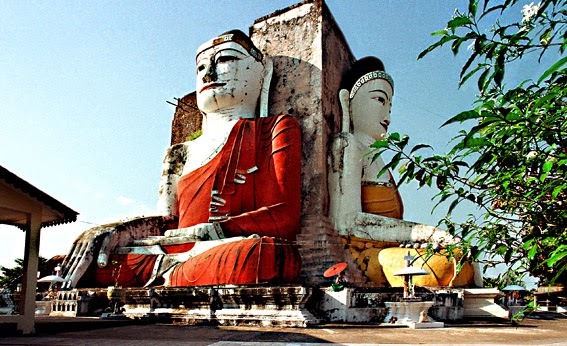 This huge reclining sculpture is in a compound just before Bago when coming from Yangon it is a popular pilgrim destination together with the Kyaik Pun Buddha close by. Plenty of great creative work is done by making them since hundreds of years, although they always look somehow similar they variations mainly depending where they are created. The artists usually bring some local ideas into the work and the proportion varies slightly in different countries, but the basics are fixed since hundreds of years. About the Shwedagon Pagoda History. Tapussa and Bhallika, two brothers of Asitanjana in Mon state went on a shopping trip to India just as it was in Burmese Days. Coincidentally they met Lord Buddha who sat under a tree. They offered him a honey cake after he ate the two asked for a gift from him, he took eight hairs and gave them to the brothers. They then returned to ox carts and ships, carrying the sacred hairs with them in a casket decorated with precious stones. On the way, they met the King ofAjjhatta, who requested two of the sacred hairs. As they traveled by ship and reached Cape Negrais at the southwestern point of the country a Naga (mythical serpent) King named Jayasena asked for two more sacred hairs from them and brought them to Bhumintara. They then placed them into the ruby casket and informed the King of Ukkalapa about it. The King came with an army of elephants, horses, chariots, and soldier, he paid reverence and with some sacred activities the hairs were brought to their original number of eight. They came back to Asitanjana and the hairs were enshrined on Singuttara Hill where relics from the previous Buddhas, a water filter of Kakusandha, the robe of Konagamana and an item which belonged to Kassapa were already placed. 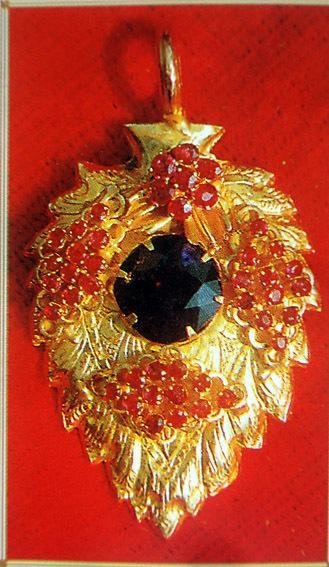 This chamber was filled with various donated jewelry, diamonds, and other precious stones. The eight sacred hairs of Gautama were washed in water and placed in a ruby casket before being placed in tiered receptacles like the others. A stone slab all covered with gold was placed over the relic chamber and on it was erected a golden pagoda 44 cubits high. The golden pagoda was encased in a silver one, a copper, and a bronze, then in an iron one, a marble and finally into a big brick stupa. These are the legends around the founding of the stupa, here is more about the architecture of the monument. This story of Tapussa and Bhallika occurs in few historical texts. Nothing is known what happens after until some texts appeared in 1485 during the reign of King Dhammazedi (1472-1492). After many years the shrine was overgrown with shrubs. About 350 years later two Buddhist monks with the name of Sona and Uttara came to Suvannabhumi or today Thaton to propagate Buddhism and miraculous the pagoda was found again. 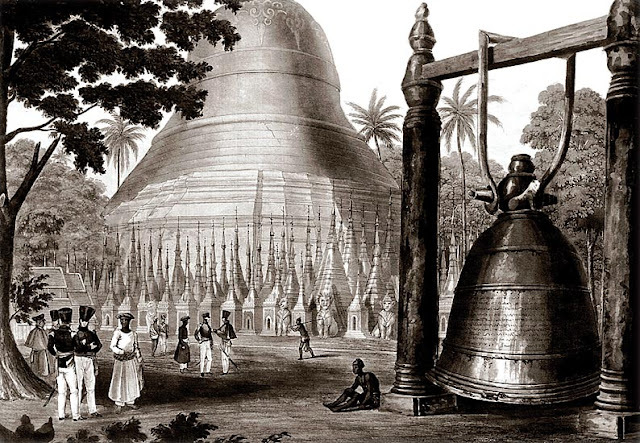 When Banya-U (1353-1385) came to the throne of Hanthawaddy (Bago) he removed the enclosing pavilion and enlarged the pagoda, raising it to a height of 40 cubits which is about 18 meters. Subsequent Mon kings renovated and enlarged the structure. The biggest enlargement was done under Shinsawbu (1453-1472). She was the Granddaughter of Banya-U, founder of the new dynasty of Hanthawaddy, and daughter of Rajadhiraj (1385-1423), a Mon hero. 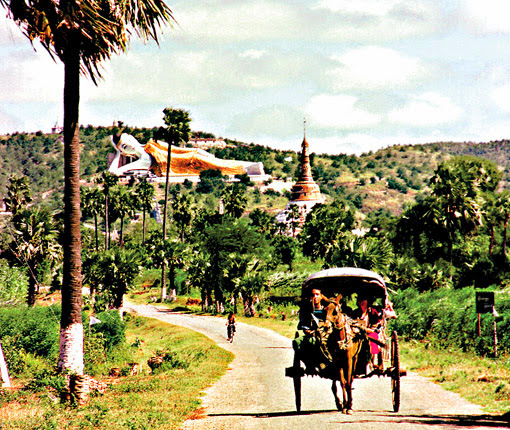 Bago is an ideal location for a day trip, some more hours traveling leads to Kyaiktiyo one of the top pilgrim destination in the country. This small city at the road crossing to Thailand and South Myanmar has the tallest pagoda in Myanmar the Shwemadaw with 114 meters. 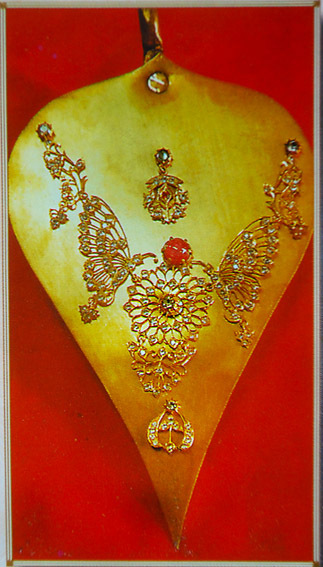 She had the shrine in Yangon enlarged and ordered the first gold layer through a donation of her weight in gold. For funds to handle the maintenance of the pagoda she donated 9,000 hectares of land. Towards the end of her life, Shinsawbu came to the Shwedagon and established her residence nearby. 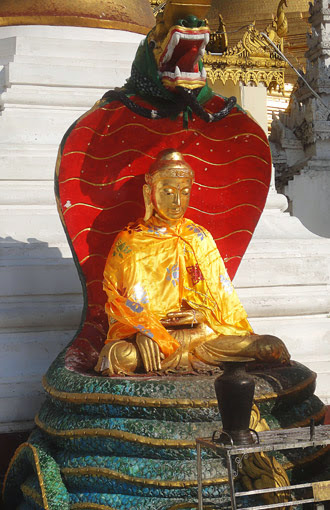 Dhammazedi, who succeeded Shinsawbu, was also a great patron of Buddhism and continued the good works at the Shwedagon. Among other things he contributed gold of a combined weight of him and the queen for more gilding and had a huge bell cast with around 3 meters wide and 5.5m tall. In the construction of new and already existing temple complexes, stupas and giant Buddha sculptures everyone tried to build something special to gain merit. 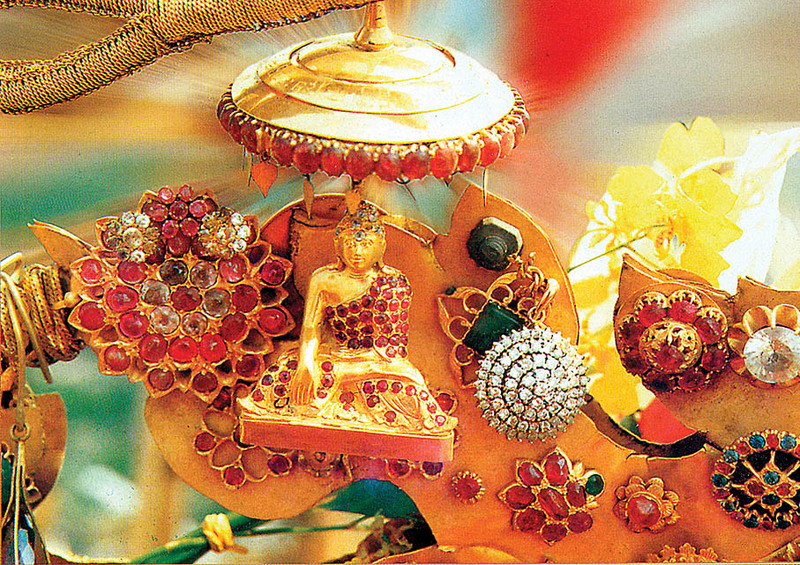 Special attention was devoted to decorating them especially those who had relics of Gautama Buddha in it. 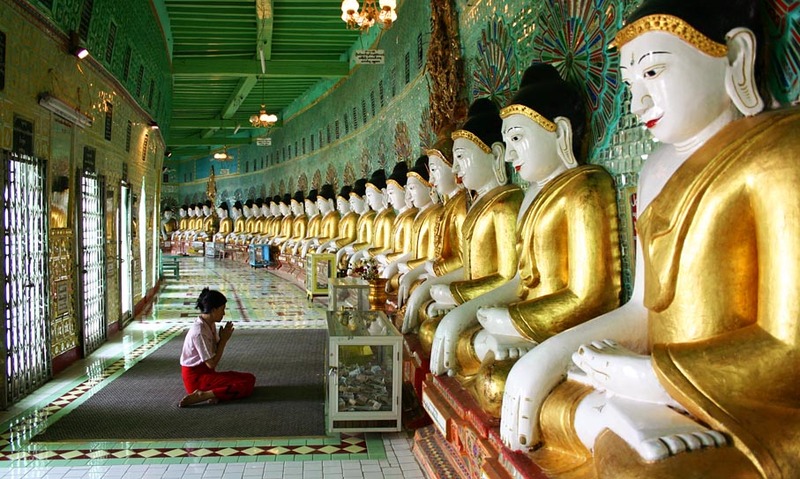 A special position among them occupies the Shwedagon. 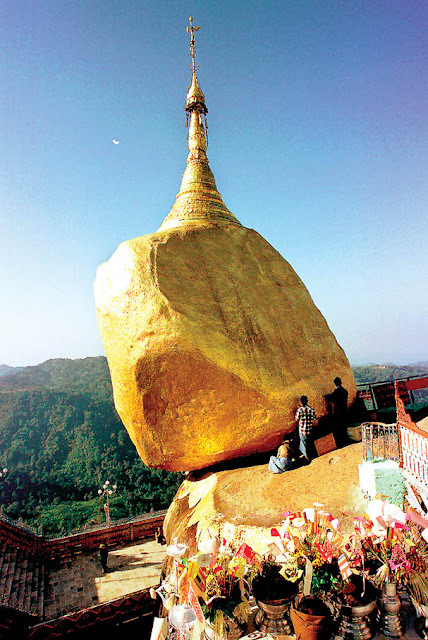 There are many thousands of stupas in Myanmar, this is the most famous - a monument of national importance. It shows the standard of an architectural ensemble not only here, but in all South East Asia. The first more or less credible information are from the late 14th Century. From palace chronicles, we know that the king of Hanthawaddy ( Pegu or today Bago), Byinnya U, renovated a stupa located near the fishing village of Dagon, from which also the name of the stupa is derived with the meaning " Golden Dagon. The reconstructed stupa had a height of about 20 m.
Some more information about repairs and renovations were issued over time. Probably all these works had something to do with earthquakes which are frequent in this area. Since the mid-16th to the beginning of the 20 Century are no less than eight earthquakes have been registered, under which the monument had suffered. An effect of this repairs was that it grew more and more. Towards the end of the 15 century The temple already reached a height of about 90 m and still during the lifetime of Queen Shinsawbu a platform was built around in the years 1455 to 1462 which was surrounded by a balustrade and walls and this way they put the “cornerstone " of the still existing ensemble on the platform. 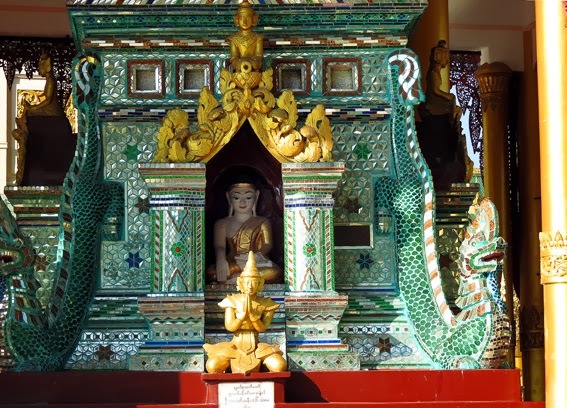 As described by Ralph Fitch in 1586: "Two or three days' journey away from Pegu raises ... a pagoda they called it Dagon with an admirable height and is gilded from bottom to top. There is also a house where the monks pray with a length of 55 steps long, inside are gilded columns flanking corridors. It is open to alien sides, and you can see many smaller columns, which are also gilded, the house itself sparkles inside and outside of gold. Also around are beautiful buildings in which the pilgrims can rest, these houses are full of statues, both men, and female, and they are all gilded. He mentioned, I mean, it's the most beautiful place in the world. They confirmed the composition of the Shwedagon towards the end of the 16th Century. Even then there were four entrances; around the stupa stood buildings for various purposes, among them, the ordination hall can be recognized easily. There the ceremonies of Monk ordinations were held, pilgrims can rest in Zayats which are hall-like open building, a post supporting the roof, and the houses are full of statues. 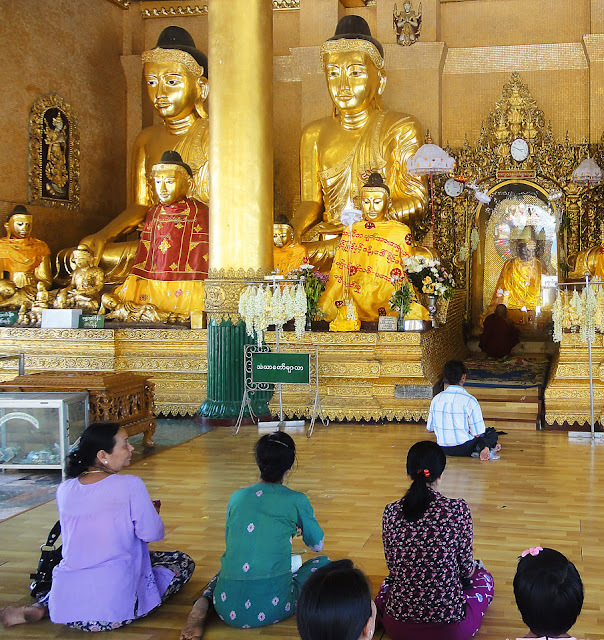 Plenty of believers prays and meditate in front of the Buddha sculptures. By the 17th Century to ensemble not yet got the final shape since it was repeatedly repaired and enlarged. 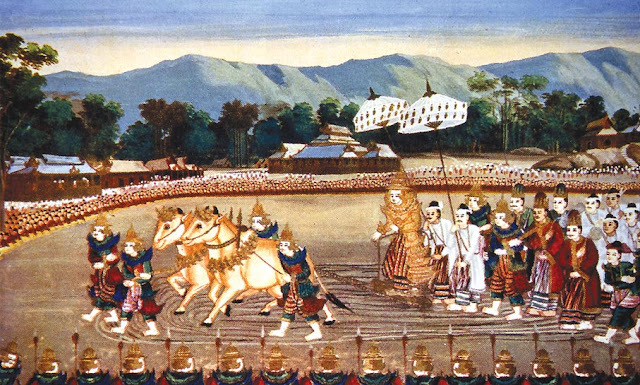 The stupa reached the current height during the Konbaung dynasty in 1774. When the King of Ava, Hsinyushin, rebuild the shrine again and the present height of 99.5 m was finalized including the silhouette. It was the overall shape which was completed by the end of the 18th century, but in the details, it has undergone changes to our days. The study of the place led to the conclusion that it is not as old as always claimed. The central stupa and some of its main parts were rebuilt in the 19th and 20th Century. The earliest buildings on the platform are from the 19th Century. 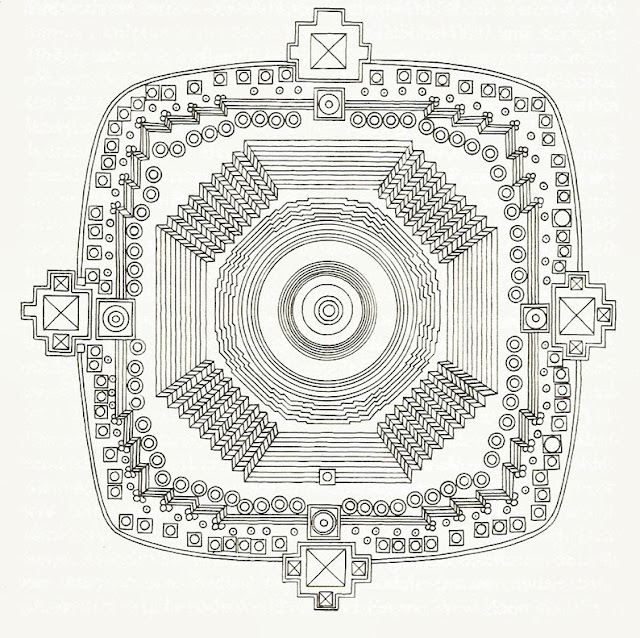 The temple ensembles grow larger but the characteristics of the composition of their floor plans remained unchanged. Outdated and damaged parts are replaced over time with new ones. The exchange of details had no significant effect on the iconographic basics of the complexes. 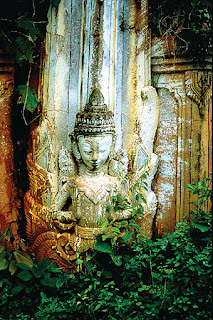 No small role in preserving the stable composition of the temple complexes played the conservative nature of the Buddhist cult architecture whose main principle was to copy older models exactly.Also, the surrounding area which over the centuries remained substantially unchanged contributed significantly help that the ensemble kept their individuality. As a result of all these circumstances, the dating is very difficult; it has a lot to do with legends, wishful thinking and myths in the 4th to 5 Century since there is inadequate archaeological evidence. The canonical form of the round stupa with traditional details was predominant, but by far not the only one in Burma. In the south half of the country, for example, rectangular stupas are visible. This form most likely followed the traditions of Mon Architecture, it was closely connected with the religious symbolism. At that time were war and the British colonial troop's killed thousands of Burmese people. 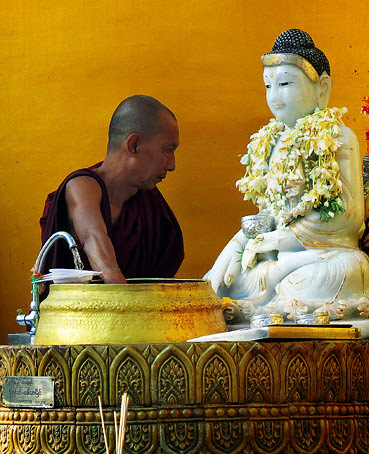 There are thousands of temples and pagodas > in the country they show the deep faith the Burmese people have in Buddhism visible at every Myanmar Burmese Journey. In the golden Shwedagon Stupa is a small chamber for storing relics of the Buddha and precious objects sacrificed for the construction of the pagoda. As such it is a basic type of structure and a characteristic Buddhist cult building, which has certain differences in the forms and the building materials used to the various other sacred buildings. As a cult the stupa has undergone a complicated symbolic interpretation which is connected with the cosmological ideas of the peoples of the East. The Shwedagon Pagoda is regarded as an image of the universe and its creative power a tree or source of life and as the embodiment of various mental states expressing man's spiritual development and state of mind plus sometimes also as a symbolic representation of Buddha. In all of this the characteristic expression of the thinking of the medieval man is reflected in the Shwedagon Pagoda in Yangon according to which the symbolism of architectural forms expresses the cosmic order. The large stupas formed the center of the architectural ensembles, which also include works of fine art. 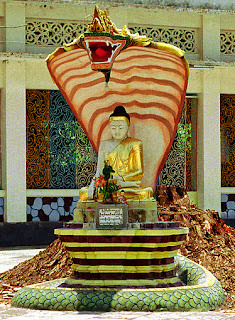 The golden shrine or even a fully sculptured Buddha statue were the subject of worship. The numerous reliefs however with which the wall surfaces are richly decorated were never considered an object of worship. These told vividly about the life of Gautama Buddha and about his past incarnations his virtues and his spiritual and moral victories. 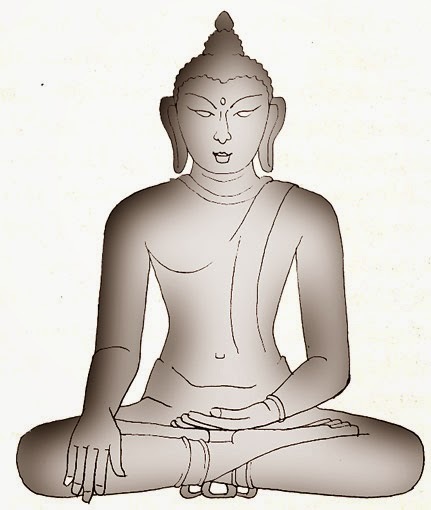 They represented a kind of introduction to Buddhism that served the atonement edification and preparation of the uninhabited. This function of works of fine art also determined the corresponding aspects of the reception of ambiguous Buddhist symbolism all this is placed on the Shwedagon Pagoda platform on Theingottara Hill in Yangon Myanmar.